As many of you know, despite almost completing her full round of medication, Parker didn't survive her bout of AGY. I just have to hope that she was happy in the home I gave her while she was still here. 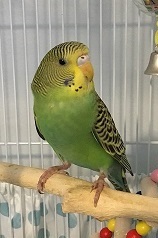 Since both my budgies have now passed on, I probably won't be around much. I'm just not sure I'm prepared to do this again right now. But I did want to stop by and thank everyone for their support and advice through both birds illnesses, and the offers to help when Parker was in need. For that I am truly grateful. I’m so very sorry Parker and Quinn are no longer with you. I can’t begin to imagine the heartbreak you must feel and I only hope that it helps you to feel a bit better knowing that you did all you could for both birds, and that they knew how loved they were (& always will be). Parker and Quinn will always be with you in your heart and your memories and I’m sure they’re watching over you from Rainbow Bridge. You are in my heart and my thoughts and I’m sending you lots of love. Deepest sympathy in the loss of little Parker. Fly high and soar freely sweet baby; rest peacefully now little one. So sorry to hear this, fly high sweet Parker. I am so sorry for the loss of little Parker. Rest in peace, little one. Fly high over the rainbow bridge. Melly, I’m so sorry to hear that Parker has passed over the Rainbow Bridge. You did your best for him. Take care..